Spending Your September: A To-Do List for Adventuring Through the Month. | The girl who loved to write about life. 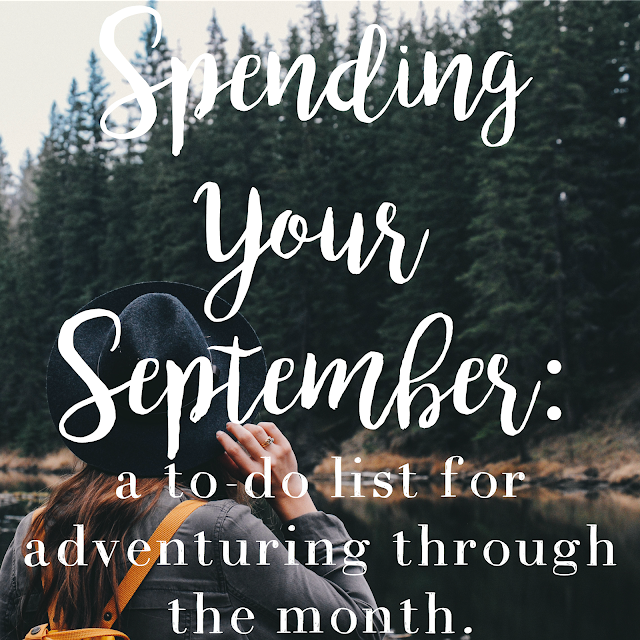 Spending Your September: A To-Do List for Adventuring Through the Month. HAPPY SEPTEMBER! The first day of September is one of my favorite days because I start celebrating fall. I normally would never miss blogging my to-do list on September 1st, but yesterday found me recovering from an abscess on my tonsils (didn't even know that was a thing) and a fever that didn't want to drop below 103. It was a rough one. BUT! It's fall! And coincidentally, we're having a tropical storm hurricane over here (casual), so the weather is very dark and gloomy and fall-ish. I'm loving it but also hoping nothing I care about blows away. Balance. Fun fact: This month marks two years since I started writing monthly to-do lists! Now! Onto some ways I think you should spend the thirty days in this fantastic month. 1. CELEBRATE FALL! I'm currently doing this with some pumpkin spice coffee. 2. But also soak up the remainder of summer. Start the day with your pumpkin coffee and then hit the pool in the afternoon. September is a weird and awesome month. 3. Enjoy the long weekend! Also, if there are any purchases you've been waiting to make, sign up for their email list today...almost everyone sends out Labor day sales and coupons. 4. Go to Hobby Lobby. That store truly shines in the fall. It's nothing short of magical. As soon as the roads are safe to drive on here, I'm heading that way. 5. Make an Autumn in New York music station. 6. Go on more walks! Cooler weather is a perfect excuse to get out of the house and get moving. 7. Play Skipbo. Chris and I love this game...I swear we're not 85 years old, it's actually a really fun game. It's also $5 at Target, so it makes for an easy and cheap night in! 8. Set up a cozy reading nook. Whether you have the space to actually create a cozy little reading space with a comfy chair and bohemian lights (I think I'm going to ask for this for Christmas), or you just have the space to get a cozy blanket and put your books next to your bed...either way, do something that makes your reading more enjoyable this fall. 9. Paint your nails a darker color. Hey, fall! 10. Start a pinterest board of all the goodies you want to bake. 11. Enjoy your first Pumpkin Spice Latte of the season! 12. Buy some pumpkin scented candles! If you happen to live with someone who doesn't love the smell of pumpkin, you can buy apple cider scented ones...they still smell deliciously like fall. 13. Set a goal of eating ___ number of meals at home this month. Let's face it: We're heading into the rest of the year where you end up spending money left and right. It's so much fun, but it can get expensive. Challenge yourself to save money where you can. 14. Discuss Thanksgiving plans with family. I know. It's crazy early. But-I said it last year, and I'll keep saying it-the earlier you can plan it (especially if you have your family and in-laws), the better. That way if there's fighting or hurt feelings or frustration, it'll put a damper on a random Tuesday in September and not on the week of Thanksgiving. It's a good system, one I'm sad I won't be able to use this year. With Chris in residency, I don't even know if I'll know my Thanksgiving plans before Thanksgiving! 15. Make a fall bucket list. Just like every other season, this one will go by too fast. Write down all the fall things you want to do! 16. Bake something with peaches. It's a sad fact of summer ending, the peaches say goodbye for a little while. 17. Buy someone who loves fall a pumpkin coffee. 18. Watch the Friday Night Lights pilot. Texas forever and fall forever. 20. DIY your own pumpkin creamer. Blog post about this coming at you next week! 21. Take a "fall reading list" trip to the library. 22. Get really good at making at-home charcuterie. This is such a fun and easy appetizer (or heck, dinner) to make at home. It's delicious and you feel fancy. It's always fun to try new things, but learn what you for sure like...what's your favorite meat? And your favorite cheese? Maybe even get crazy and break out an actual cheese board! 23. Donate any summer clothes that you've gone the whole summer without wearing. 24. Put out some fall decorations! Whether you go all out with scarecrows and sunflowers, or you just buy a pumpkin at your grocery store and put it on your porch...decorating is an easy way to celebrate a season every single day. 25. Do something nice for someone else. 26. Do something nice for yourself. 27. Buy some mums for your front porch. If you accidentally kill them, you can pretend September was just practice and get more in October! 28. Decide to really savor this season. For some people, that looks like saying yes to more and going allllll of the places. For other people, that looks like saying no more and spending more nights at home. Whatever it looks like for you, do it! 29. Buy a new hat. Because FALL. 30. Spend an evening outside, drinking a PSL, reading a good book. Happy September! How will you be spending your month?